The Sinn UX pushes watch technology to the limits. Like the Sinn U1 and U2 watches, the Sinn UX features a case made from the same submarine steel that is being used to build the latest generation of German military submarines. Unlike the Sinn U1 and Sinn U2, the Sinn UX features a quartz movement rather than a mechanical movement. The Sinn UX is covered with a thick sapphire crystal for extreme protection. This sapphire crystal features a special anti-reflective coating that is scratch resistant - the coating itself has been hardened to 1,800 HV. Other features include sapphire crystal with anti-reflective coating. Strap is silicone rubber with double push deployant buckle and fliplock safety clasp. "The UX surpasses all rivals"
Super-accurate, thermo-compensated ETA quartz movement service costs similar to (or cheaper than) mechanical watches, etc., etc. And, amazingly, it's only 13mm thick, so it fits under a cuff as well :) For the money, there's nothing better IMHO. "Sinn UX EZM Hydro - Awesome Watch"
Verified Owner Comments: I love my Sinn UX EZM Hydro. Totally different from my Sinn U1 - I LOVE both of them. I am always getting comments on both watches. 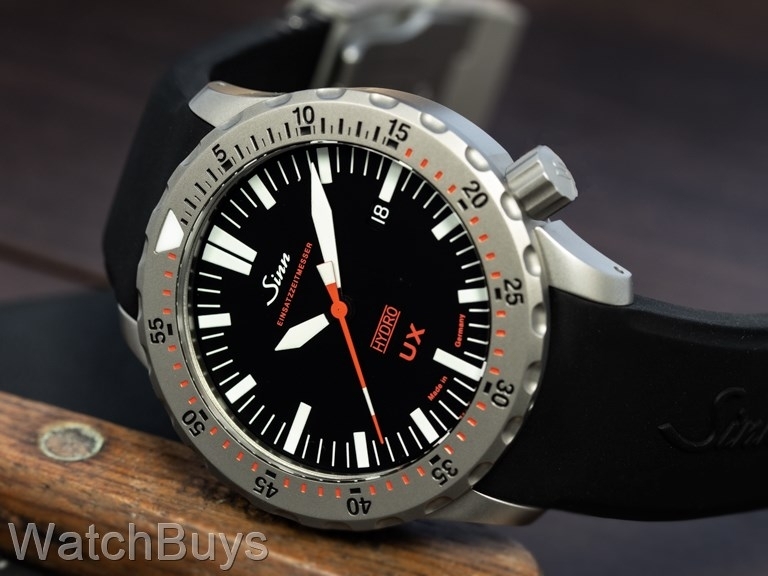 Verified Owner Comments: Totally overjoyed that I purchased the Sinn UX EZM 2 B Hydro. The size, weight on the wrist and clarity of the dial are absolutely perfect. It has quickly become my everyday watch of choice for all occasions. "The one of a kind Sinn UX"
Verified Owner Comments: Unlike any other watch. It may look like other divers, especially its brothers the U1 and U2, but the UX is unique. It has striking clarity, the most accurate quartz movement made and engineering that puts Rolex to shame. A great watch that looks great on the wrist. Verified Owner Comments: Excellent watch that is always accurate. The case, bezel and crystal are all scratch-free after three years of wear. Only suggestion is that I would get the tegimented buckle, as this is the only portion of the watch that shows any wear (fine scratches). Verified Owner Comments: I have owned several Sinns and have loved all of them, when the U1 came out I had to have one...great watch, the feel and look of is so substantial. I recently picked up a UX Hydro...BEST I'VE HAD SO FAR !!! Usually not a Quartz fan but this watch is "spot on" accurate all the time, and per the manufacturer's review it is the most "readable" watch I have ever owned. Regardless of how extreme the angle of vision every character and marking is crystal clear.